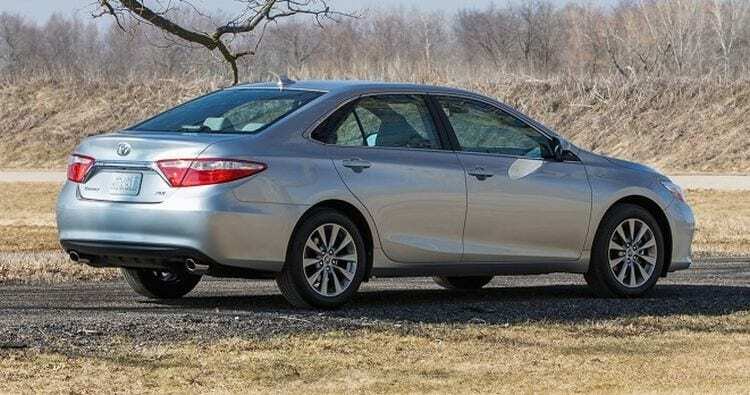 No doubt, Toyota Camry is one of the best-selling vehicles in the world in its mid-size sedan segment, making the expectations go up for the new model. Facing fierce competition from Hyundai, Ford, and Mazda, Toyota decided to give one of its most popular models a major redesign, which could impress the customers even more. The company has achieved its goal, as only one look at the overhauled 2016 Camry reveals its considerable refreshing. The curves flow much smoother and the bodywork is also all new, making the vehicle look aggressive and modern. Wide mouth like grille and LED lights available in the front are making the face of the new Camry the most aggressive in its design, which is perfectly aligned with other elements, including 16-inch or 18-inch alloy wheels. Chrome bar connects the taillights and is placed across the trunk. A moonroof is another design feature that comes in special edition trim and will be loved by the drivers. The 2016 Camry will be offered in five trim levels: LE, SE, XLE, XSE, and Special Edition. According to the Toyota’s website, these trims will be divided into two groups in terms of equipment. Specifically, LE and XLE trims will be considered as conventional lineup because of their traditional elements (16-inch alloy wheels, 6.1 touch screen, cloth seats and rearview camera). On the other hand, SE trim will be included in the sporty lineup due to different feature set (17-inch alloy wheels, Sports Fabric leather seats, silver interior and leather-wrapped steering wheel). Finally, the rest of the trims also include heated seats, smartphone navigation, 7-inch touch screen and even larger 18-inch wheels). In terms of engines, the Toyota’s engineers decided to keep the three types from the previous year’s model. 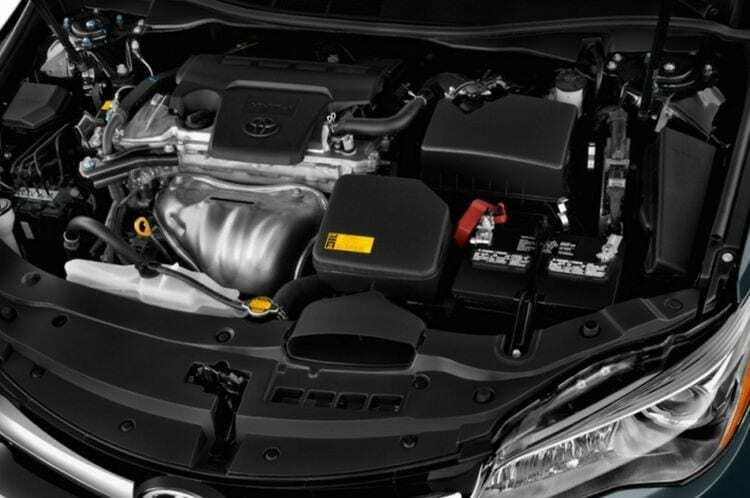 Therefore, the standard powertrain in the new Camry will be the 2.5-liter unit capable of producing 178 horsepower. The automobile experts already condemned this decision because of lack of some features, including direct injection and turbocharging. However, customers can get more power with an optional 3.5-liter engine, which produces 268 horsepower and is much more engaging than the base one. It is capable of reaching 60 miles per hour in less than 6 seconds, which is more than enough for Toyota Camry (considering that it is a family sedan). Undoubtedly, the family oriented drivers will be very glad to enjoy the capabilities of this optional engine because it’s quite quick and returns good acceleration. Depending on the engine you will be getting 24/35 mpg city/highway with the 2.5-liter engine and 21/31 mpg with the optional and more powerful 3.5-liter unit, which is pretty good for the segment. The range of the 2016 Toyota Camry is estimated at 425 and 595 miles for the standard and optional engines respectively. The engines are paired with Toyota’s six-speed automatic transmissions which showed great performance in terms of speed and fuel economy. The third type of the powertrain is the hybrid that utilizes 2.5-liter Atkinson-cycle unit and electric motor. This vehicle uses a number of unique features, including very cool Hybrid Synergy Drive System, featuring in every modern Toyota Hybrid. According to the company’s website, it is a smart technology that “senses” the situation on the road and shifts the car fuel settings between gas and electricity-optimizing the power delivery. As the result, the vehicle achieves maximum efficiency with sufficient acceleration and impressive driving performance. The technology once again shows the Toyota’s commitment to reduce the carbon emissions in its vehicles and a high level of sophistication of hybrid development approaches. The performance in terms of fuel efficiency of hybrids is competitive, measured at 43/39 mpg (LE trim), 43/39 mpg and 40/38 mpg for SE trim and XLE trim respectively. 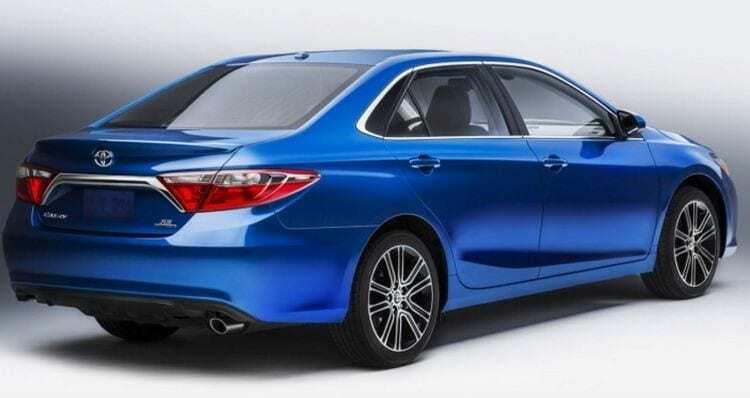 Therefore, the new Camry will be very much enjoyable for the drivers because of its fuel efficiency and engine capabilities no matter which option you choose. In addition, the customers will also enjoy the infotainment systems in the new Camry that comes equipped with a number of features such as USB connector, six speakers, touchscreen audio, CD player, voice recognition feature and hands-free calling. Pretty amazing, considering that all of the listed features are available on the base trim LE, right? The other trims get even better features, including the Entune Audio Plus unit, which uses a special app to connect the owner’s Android or iOS smartphone to control the navigation functionality. Now you can easily access all the content that you need directly on the Internet through services like Yelp, Pandora, and Bing search. The previous year model has been delivered with some great safety and comfort features. Unlike the 2015 model equipped with dual front and side curtain airbags, the next generation Camry carries knee airbags, rear side airbags, and blind spot monitoring. Moreover, XLE and XSE trims include lane departure notification warning system, automatic braking system and pre-collision system, which became standard offer in most today’s luxury sedans. In terms of comfort, the vehicle is equipped with things like dual vanity mirrors which show that Toyota really delivers a lot of attention to small bits and pieces, additionally features like air conditioning and interior air filtration are standard. So, if you are wondering how much it costs, here are the numbers. The price starts at $23,070 for the first model of the range, Camry LE with the 2.5-liter engine. It goes up to $26,310 for the XSE trim, which also can be added with numerous optional features that increase the cost. The price for the Special Edition and Hybrid Camry begins at $25,715 and $26,790 respectively. The most expensive model in the range was Hybrid XLE, the starting price for which was set to $30,140. Having reviewed all the features of the new 2016 Toyota Camry, it is sufficient to suggest that it will continue to be one of the best choices in the sedan segment. If the new model is as reliable as the previous ones, it is definitely going to be the vehicle of choice for most American and European customers. So far, 2016 Camry is getting great reviews all around the world, which identified only a few shortcomings, including uninspiring handling and tire noise. However, they are outweighed by a much higher number of advantages which suggests that the new Camry is more capable than ever before. New Camry is more capable than ever before, I like all of the changes they’ve made.